With a recent surge in popularity, Bin Stores are becoming a common sight in gardens and driveways up and down the country. An ideal way to hide unsightly wheelie bins from view, these hideaways are designed to be tidy and smart in appearance to match with most garden types. 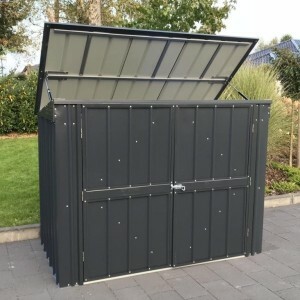 Depending on the individual design, Bin Stores can be either positioned against walls or standalone (check for compatibility of item) so you can choose the perfect spot to suit your property. 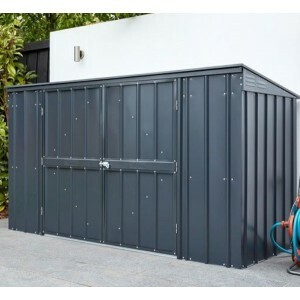 If you have concerns on the security of your wheelie bins then a bin store could be the answer. Padlockable lids and doors are included on most models to prevent unauthorised access and keep your bin firmly in place. Available in a range of different materials and designs there is a bin store to suit every property! 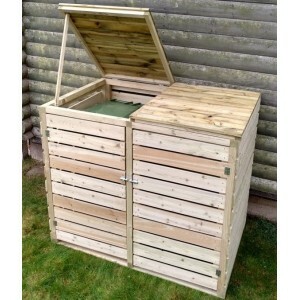 The Double Wheelie Bin Hide from Forest is designed to hide unsightly bins and keep your garden look.. The Lotus 5ft x 3ft Bin Store by StoreMore in Anthracite Grey is designed to hide unsightly bins and.. The Lotus 7ft x 3ft Triple Bin Store by StoreMore in Anthracite Grey is designed to hide unsightly b.. The Pantheon Double Bin Store from Storemore is designed to hide unsightly bins and keep your garden.. The Sapphire 5ft x 3ft Double Waste Bin Store by StoreMore in Anthracite Grey with off white trim is..